24 June/July 2018 unmanned systems inside P P IP Integration Pilot Program Team Profiles "Right now this project is such that this process is so formalized by the fed- eral government that it's very impor- tant we stay within the boundaries of their program," said Bob Brock, direc- tor of aviation for the state of Kansas. "However, we've established a site to be able to allow people to express interest schedule would be for their release. There will also be white papers and reports on the teams' progress at the annual FAA Symposium. "I can't imagine us having our annu- al symposium next year and not having some type of forum on specific opera- tions and a report out of how they've done," he said Those who want to be more directly involved may have an opportunity later in the year. The teams have to stay fo- cused on the plans they submitted to the FA A, Lawrence said, but added there is still room for change. "Now with any project, when you get into implementing those things; you learn things, you find things out," Lawrence said. "You may have to add a partner—you may have to change a partner or something like that in or- der to be successful in that operation. Obviously that will occur." According to Serol, the teams have been told they need to hew close to their submitted plans until August. After that point, however, it will be possible for them to make adjust- ments in their partnerships and plans. Photo courtesy of North Dakota Dept. of Transportation. RESOURCES It's also possible that there will be an- other round of teams chosen, Lawrence said, but it's too early to know. "Adding more (teams) as par t of the prog ram …that w ill be rea lly based on resources and we are con- cerned—not that we won't succeed but (that) we don't know how much total resources it's going to take just to work w ith the 10 we have now," Lawrence said. That does not mean those organi- zations that did not get selected can't keep going. According to Lawrence, at least 50 percent of those who ap- plied for the IPP were hoping to work on things they were already able to do under the Part 107 regulations or as a public operator. "They simply didn't know the rules," Lawrence said, "or they were looking at one of the barriers that was still out there"—the time needed to get airspace approval. 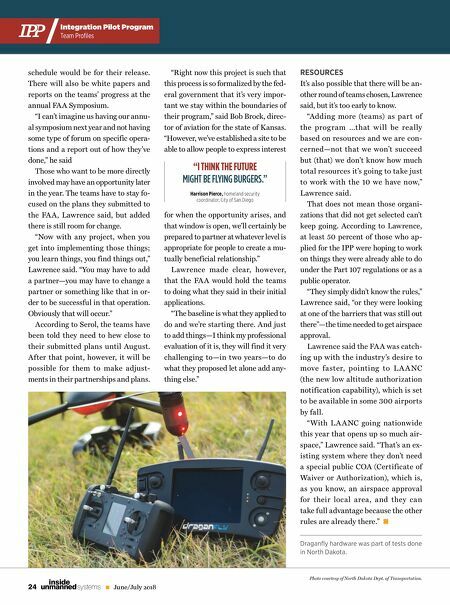 Lawrence said the FA A was catch- ing up with the industr y's desire to move fa ster, pointing to L A A NC (the new low altitude authorization notif ication capability), which is set to be available in some 300 airports by fall. "With L A A NC going nationwide this year that opens up so much air- space," Lawrence said. "That's an ex- isting system where they don't need a special public COA (Certif icate of Waiver or Authorization), which is, as you know, an airspace approval for their local area , and they can take full advantage because the other rules are already there." Draganfly hardware was part of tests done in North Dakota. "I THINK THE FUTURE MIGHT BE FLYING BURGERS." Harrison Pierce, homeland security coordinator, City of San Diego for when the opportunity arises, and that window is open, we'll certainly be prepared to partner at whatever level is appropriate for people to create a mu- tually beneficial relationship." Law rence made clear, however, that the FA A would hold the teams to doing what they said in their initial applications. "The baseline is what they applied to do and we're starting there. And just to add things—I think my professional evaluation of it is, they will find it very challenging to—in two years—to do what they proposed let alone add any- thing else."